Money warrant for 97l. 10s. 0d. to William Clarke, Keeper of Bagshot Rails in Windsor Forest, for 3¼ years to, 1695, Lady day, on an allowance of 30l. per an. for providing hay for the deer there. (Money order dated April [? 29] hereon.) Money Book XII, p. 489. Order Book IV, p. 179. 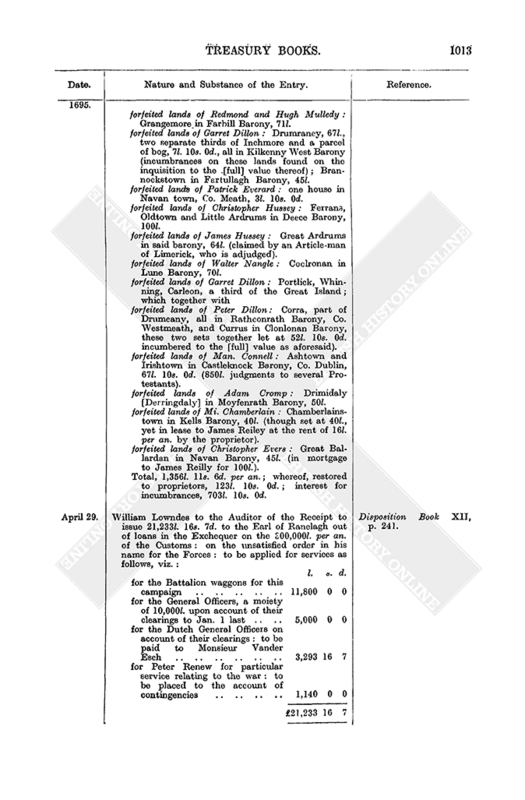 William Lowndes to the Earl of Ranelagh to apply as follows 70,054l. 0s. 6d. remaining in your hands of the loans on the 300,000l. of the Customs and 100l. of loans on the Land Tax [the third 4s. Aid] making 70,154l. 0s. 6d. in all, viz. : l. s. d. Disposition Book XII, p. 238. William Lowndes to the Auditor of the Receipt to issue 7.006l. 0s. 2d. to the Earl of Ranelagh on the unsatisfied order in his name for the service of the Forces: to be issued out of loans by the Bank on the 300,000l. per an. of the Customs. This sum, together with 8,193l. 19s. 10d. ut supra, will complete 15,200l. for subsistence ut supra. Disposition Book XII, p. 238. Same to Lord Villiers to report on the enclosed petition [missing] of the five Postillions to the late Queen, praying to have the usual allowance of 5d. a day out of the coachmen's wages as formerly. Out Letters (General) XIV, p. 377. Royal warrant to the Attorney or Solicitor General for a great seal for a grant to Richard Harrison of London, merchant, George Petty and Michaell Godfrey, esqs., of the office of surveyor of the petty Customs and subsidies in London port, in reversion of Sir John Stapeley's interest therein; [the present grant to be] for the natural lives of Richard and William Lumley, younger sons of Richard, Earl of Scarborough: with the usual fee of 300l. per an. and all other fees and profits Thereof: said office having been granted 1671–2, Feb. 8, to George Porter, esq., with reversion to said Stapeley, and again in 1674, Dec. 4, granted to Richard Mountjoy, jun., William Waterson and Phillip Marsh of London, gent. (in reversion of Porter and Stapeley) for the life of Sir Richard Fanshaw, bart. ; both Porter and Fanshaw being now dead. King's Warrant Book XVIII, p. 129. Same to Mr. Blathwayt to procure a royal warrant to authorise the Earl of Ranelagh to pay 3,000l. to Isaac Teale, Jonathan Leigh and others, the apothecaries appointed to prepare medicines for the Army and Hospitals, on account of what remains due to them for furnishing the Army Hospitals and Jamaica Expedition with medicines for the year 1694. Out Letters (General) XIV, p. 378. Treasury reference to the Excise Commissioners of the petition of Mary Bryan, praying to be discharged the 13l. 15s. 4d. which she is indebted for duty on mead, she being noways able to pay. Reference Book VII, p. 91. Report to the Treasury Lords from William Blathwayt on the petition of Lord Cutts, ut supra, p. 952. I have discoursed Lord Cutts thereon, who has reduced his request to the grant of the forfeited bonds lying in the hands of Sir Nicholas Crisp, collector outwards, London port, and of the other officers in the outports relating to the Plantations, and to the grant of the estate of William Meires of Barbados, escheated to the King. The bonds may be granted if the Customs Commissioners, to whom the matter belongs, have no objection. The value of the escheat is not yet discovered. I have nothing to object to its grant as a gratification to petitioner. Out Letters (Plantations Auditor) I, p. 419. Royal warrant to the Clerk of the Signet for a privy seal for a grant to Thomas Wilkins, gent., of the Crown's title to the Customs debts and bonds and the surety bonds for securing same as follows, viz. Richard Beere, late collector at Carlisle, 309l. 18s. 11d. ; Nath. Franklyn, late collector at Deal, 57l. 3s. 11d. ; John Handford, late collector at Weymouth, 55l. 11s. 9½d. ; Edward Rope, late collector at Dartmouth, 65l. 13s. 10½d. ; Thomas Shipton, late collector at Whitby, 226l. 14s. 4d. ; William Lynsted, late collector at Lynn, 99l. 12s. 6d. 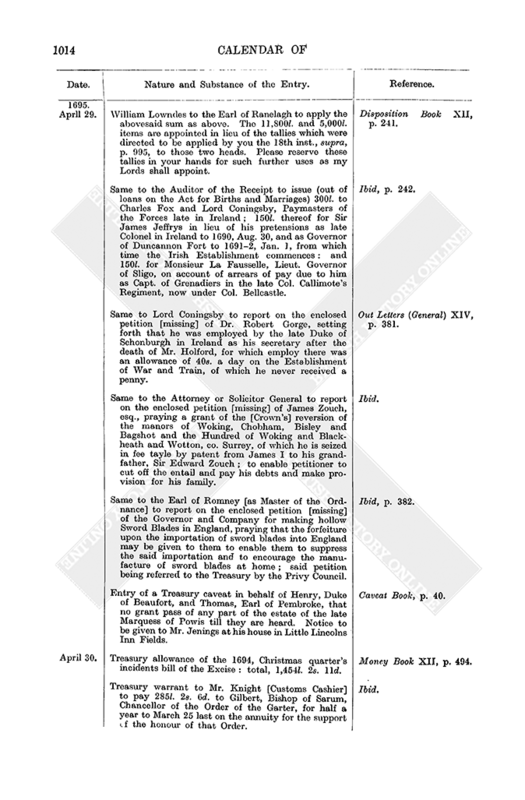 ; the executors of Sir William Poole, late collector at Bristol, 1,250l. 14s. 2d. ; Thomas Spry, late collector at Penryn, 93l. 17s. 0d. ; Griffen Bowen, late collector at Padstow, 271l. ; James Warring, late collector at Deal, 171l. 14s. 0d. ; Jno. Peters, late collector at Looe, 267l. 8s. 2d. ; Goodwyn Aubery, late collector at Rye, 216l. 7s. 3d. ; Augustin Heardston, late collector at Poulton, 245l. 11s. 4d. ; John Thorp, late receiver in London, 107l. 5s. 0d. ; Elias Pratt, late collector at Berwick, 24l. 17s. 0d. and John Glover upon bonds 652l. ; most of which debts as is certified by Richard Hutchinson, solicitor of the Customs, have been some time before him for prosecution and that the said debts are not appropriated [for being due on Customs funds liable to appropriation under any Act of Parliament]: and the King is pleased to grant same to said Wilkins of his special grace. King's Warrant Book XVIII, pp. 126–7. Same to the Attorney or Solicitor General for a great seal for a grant to Elizabeth Tillotson, relict of John, late Archbishop of Canterbury, of an annuity of 400l. for life for her better support, she being left in a very necessitous condition: to be payable out of the Four and a Half per cent. Duty from 1694, Sept. 29. Ibid, pp. 128–9. Also for a release and discharge to her of the sum of 2,682l. 12s. 2d. owing to the Crown for the First Fruits of the said Archbishopric and for the delivery up of the said Archbishop's bonds given on the installing of said First Fruits. Same to the Clerk of the Signet for a privy seal to authorise the Treasury Lords to appoint General Receivers of the duties granted by the Act [6 and 7 Wm. III, c. 6], granting certain rates and duties upon marriages, births and burials, bachelors and widowers for five years. Ibid, p. 129. Same to the Auditors of Imprests to allow in account to John Richards, gent. (“who was appointed to make such payments as was usually made in the Office of the Treasurer of our Chamber during the vacancy of that Office”), the sums of 220l. 0s. 10d. which by direction of the Treasury Lords he paid to the Almoner for the Maundy for the year 1693, and 237l. 9s. 4d. for the Maundy for 1694: Ibid, p. 132. And further to give allowance to the Treasurer of the Chamber for all such moneys as he hath or shall annually pay by like direction to the Almoner for the Maundy. Royal warrant to the Clerk of the Signet for a privy seal to authorise the Treasury Lords to direct the relative officers of the Exchequer to take in loans, deliver out tallies, orders etc. under the terms of the Act [6 and 7 Wm. III, c. 5] for granting a further term in annuities for life (“to enable annuitants to purchase further or more certain interests in such annuities” etc.). King's Warrant Book XVIII, p. 139. Royal sign manual for the following payments: l. s. d. Ibid, p. 185. Order Book IV, pp. 191, 215. William Lowndes to the Customs Commissioners to send an officer to Monsieur Zulestein's lodgings in Whitehall to seal his goods in order to their despatch to Holland. Out Letters (General) XIV, p. 378. Same to same to send similarly to visit and seal the King's goods and those of his servants which are now in the Beer Cellar at Whitehall under the care of Monsieur Isaac, in order to their being sent to Holland. Ibid. Same to Sir Edward Gregory with Mr. Dummer to view the Victualling Office at Chatham and report a reasonable rent for the Crown to pay for a 21 years' lease thereof. (The like letter to Mr. Dummer.) Ibid. Treasury reference to the Customs Commissioners of the petition of the Newfoundland merchants [merchants trading to Newfoundland] for [leave to] several ships to go thither: same being referred to the Treasury from the Privy Council the 21st inst. Reference Book VII, p. 91. 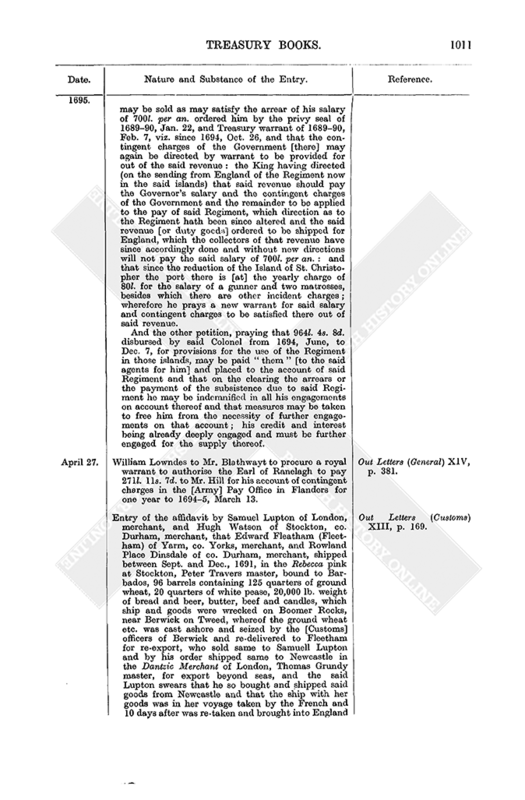 Same to the Postmasters General of the petition of Edmund Moore for a place as a sorter of letters loco William Symonds, who is dead or dying. Ibid, p. 92. Royal warrant [to the Lords Justices, Ireland] for an allowance of 10s. a day to Charles De Sailly to be inserted in the Military List of the French Pensioners on the Establishment of Ireland: as from the 1st inst. during pleasure. Out Letters (Ireland) VII, p. 6. Same to the Attorney or Solicitor General for a great seal for a grant to Francis, Earl of Bradford, of the fee farm rent of 66l. 13s. 4d. per an. issuing out of Brigstock Great Park and other lands, co. Northants: and of all arrears due to the Crown thereon: the consideration to be the grantee's charges in the recovery [of the Crown's title] of the same and a fine of 916l. 3s. 4d. to be first paid into the Exchequer. King's Warrant Book XVIII, pp. 125–6. Same to the Clerk of the Signet for a privy seal for 20,000l. to Henry de Nassau, Seigneur D'Auverquerque, Master of the Horse; as imprest for the extra ordinaries of the Stables [when with the King] abroad and for the charge of Stable mourning for the late Queen. (Money warrant dated May 8 hereon. This warrant quotes the privy seal as dated April 30.) (Money order dated May 10 hereon.) Ibid, p. 130. Money Book XII, p. 508. Order Book IV, p. 184. Same to Edward Russell, Treasurer of the Chamber, to pay to Richard Longbottom, barber in ordinary to the King, 170l. for one year to Lady day last on his allowance for providing instruments, looking glasses, combs, razors, wash boulls and all other necessaries except linen for the King's use: and to pay him the said yearly allowance in future. King's Warrant Book XVIII, p. 131. Royal sign manual for 1,500l. to William de Nassau, Master of the Robes; as imprest for the Office of the Robes. (Money warrant dated April 26 hereon.) (Money order dated April 26 hereon.) Ibid, p. 132. Money Book XII, p. 493. Order Book IV, p. 177. Same for 10,000l. to William Lowndes for secret service, without account. (Money warrant dated April 26 hereon.) (Money order dated April 26 hereon.) King's Warrant Book XVIII, p. 132. Money Book XII, p. 493. Order Book IV, p. 177. Same for 2,500l. to James, Duke of Ormonde as royal bounty. (Money warrant dated April 26 hereon.) (Money order dated April 26 hereon.) King's Warrant Book XVIII, p. 132. Money Book XII, p. 493. Order Book IV, p. 177. Same for 1,514l. 13s. 4d. 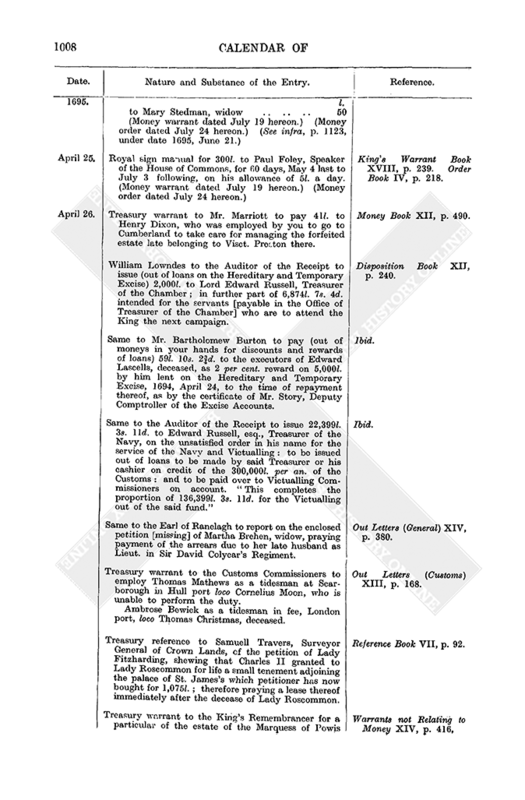 to Mary Bocock and 80 others, named, poor pensioners: as royal bounty: the list being the same as on p. 868, supra, save that the names of William Aldham, Alice King and Ann Fitzharry are here omitted; the name of Bovis Gough is substituted for that of E. Madge and the following names are inserted, viz. Col. — Phelips, 200l. ; — Povey, 100l. ; Margaret Blake, 30l. ; Dame Mary Kirke, 75l. for three quarters' rent to Feb. 17 last for the house Mris. Mary Kirke lives in; Dame Sarah Newcomen, 50l. ; Eliz. Churchill, 10l. (Money warrant dated April. 27 hereon.) (Money order dated April [sic for May] 3 hereon. Against the name of Mary Blake is written “this is paid no more”.) King's Warrant Book XVIII, pp. 133–5. Order Book IV, pp. 180–1. Royal warrant to the Clerk of the Signet for a privy seal to require the Treasury Lords to forthwith direct the relevant officers of the Exchequer to take in loans, not exceeding 650,000l., on the Act [6 and 7 Wm. III, c. 6] granting rates etc. on marriages, births etc. : with 8 per cent. interest: the orders to be registered etc. as by the terms of said Act. King's Warrant Book XVIII, pp. 136–7. 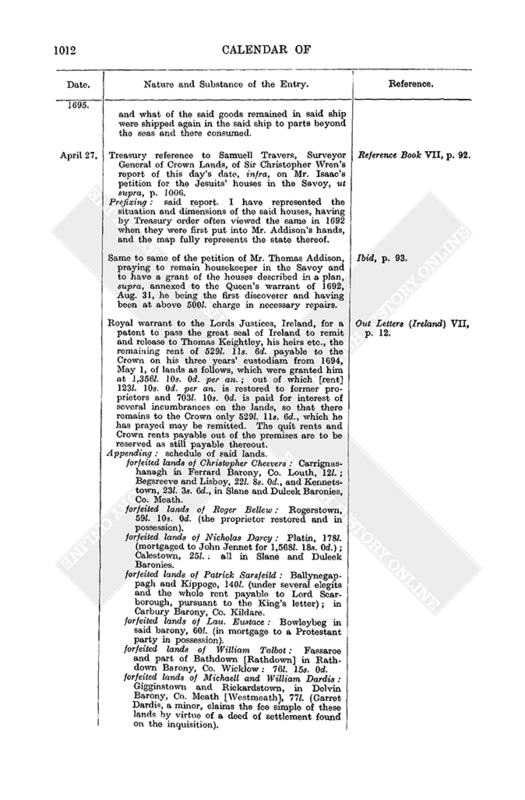 Same to the Lords Justices, Ireland, to take from the Duke of Ormonde an authorisation to empower the Revenue Commissioners, Ireland, to collect the duties of Prizage and Butlerage in the several ports and places in Ireland for seven years from Lady day last under the Duke's proposal for letting the same to the Crown for said period at a rent of 1,500l. per an. : the said Commissioners having, in their report of March 23 last on said proposal, set out the produce of said duties for several years past, with their opinion that the proposal would be to the advantage of the revenue and encouragement of trade. Out Letters (Ireland) VII, p. 26. In accordance therewith a patent is hereby to pass the great seal of Ireland for paying said rental to eaid Duke for said period. Same to the Clerk of the Signet for a privy seal to authorise the Admiralty Lords to sell decayed ships and stores (to dispose of the several ships, vessels and stores specified in the schedule hereto [missing] which upon a survey have been found unuseful for our service in the Navy, and to pay the proceeds thereof to the Treasurer of the Navy upon account, the said decayed stores etc. being in the several yards of Deptford, Woolwich, Chatham, Sheerness, Portsmouth and Plymouth). King's Warrant Book XVIII, p. 240. Money warrant for 40,000l. to Ralph, Earl of Montagu, Master of the Great Wardrobe, as imprest for the service of the Great Wardrobe, to complete the 100,000l. as by the privy seal of 1692–3, Feb. 28, supra, Calendar of Treasury Books, Vol. IX, p. 50. (Money order dated April 27 hereon.) Money Book XII, p. 489. Order Book IV, p. 178. Treasury warrant to the Excise Commissioners to repay to the Excise Officers and Salt Officers of not above 100l. per an. salary their assessments to the 4s. Aid for the year from 1694, Christmas. Money Book XII, pp. 498–9. William Lowndes to the Auditor of the Receipt to issue 15.000l. to the Earl of Bradford, Treasurer of the Household, out of loans made or intended to be made by Lancelot Burton on credit of the Hereditary and Temporary Excise: to be issued on said Earl's order for the service of the Household to complete the 19,385l. for the servants who are to attend the King in Flanders the next campaign. Disposition Book XII, p. 239. And 1,250l. to the Duke of Ormonde out of the like loans. William Lowndes to Mr. Bartholomew Burton to pay (out of moneys in your hands for rewards etc. on loans) 325l. to Lancelot Burton for 2 per cent. discount or reward on the above 16,250l. loan. Disposition Book XII, p. 239. Same [to the Auditor of the Receipt] to issue to me [Lowndes] 600l. for secret service: on orders which you shall receive: to be issued out of loans on the Hereditary and Temporary Excise. Ibid. Same to same to issue 4,000l. to Charles fox and Lord Coningsby out of loans in the Exchequer on the 300,000l. of the Customs: to be paid over to the Commissioners of the Transports on account of the transport service. Ibid. Treasury reference to Sir Christopher Wren of the petition of Cha. Isaak for a lease of some buildings in the Savoy wherein the Jesuits in the late King James's reign erected a College and which are now in the custody of Mr. Addison for the King. Out Letters (General) XIV, p. 379. William Lowndes to the Board of Greencloth. The case of the Cofferer's fees [on payments] for the expense of the [part of the] King's household in Flanders has been laid before the King, who has declared that he shall be allowed his usual fees on his payments on that account the last year. Please allow same accordingly. Ibid. Same to the Agents for Taxes to report on the enclosed letter [missing] sent to the Chancellor of the Exchequer from some of the inhabitants of the county of Northampton, complaining that the Receivers of the Taxes refuse to take the half crowns which they [complainants] look upon to be current coin of the kingdom. Ibid. Treasury order to the Customs Commissioners to observe (a) infra. Out Letters (Customs) XIII, p. 159. 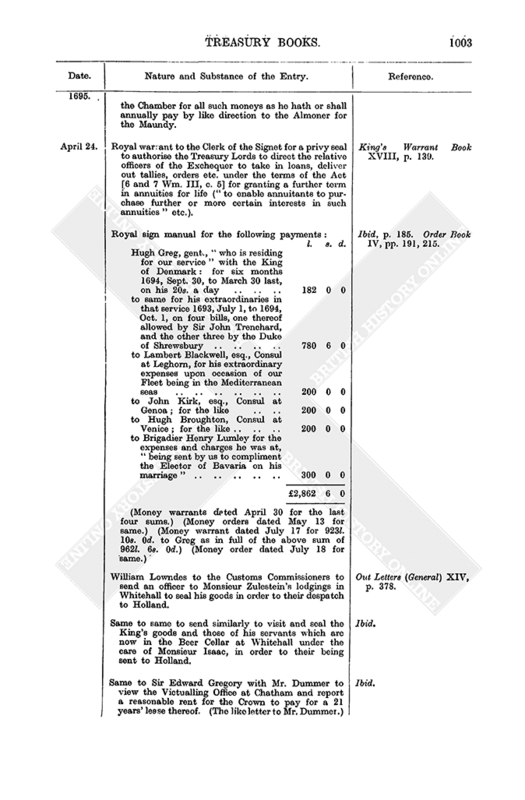 Prefixing: (a) Order of the King in Council, dated Kensington, March 21 last, granting leave to several merchants using the Newfoundland trade to send out four ships, the Elizabeth, Thomas Parsons master, 70 tons, four seamen, three landmen; Joseph, Jo[h]n Sharp master, 100 tons, six seamen, three landmen; James frigate, Jer. Peirce master,. 80 tons, six seamen, four landmen; and Valiant Mary, Edwd. Wills master, 170 tons, 18 seamen, 10 landmen, on April 1 inst. : this being the only time to send out such ships to fish. They are to give bond to go to Newfoundland and to no other part of America. Treasury reference to the Surveyor General of the petition of John Neale for a grant of the [Crown's] inheritance of the manors of Denbigh, Bromfeild and Yale in the Dominion of Wales, Reference Book VII, p. 92. Treasury reference to Sir Edward Ward, Attorney General, of the petition of John Wheeler and Henry Stancomb of Bristol for a noli prosequi to the suit against them on a coast bond. Reference Book VII, p. 92. 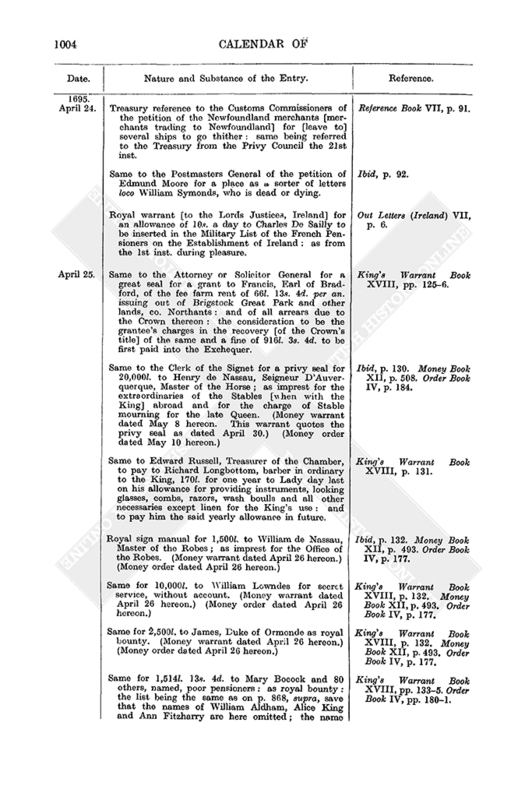 Report to the King from the Treasury Lords on the petition of the Irish officers who came over on the surrender of Limerick, as by the order of reference from the Privy Council of 1694, July 26: petitioners setting forth that they are in a starving condition and praying a supply of money. We have referred same to Lord Coningsby and then to Charles Fox and George Clarke. Lord Coningsby reports that he has heard that the Earl of Athlone, when General of the Forces in Ireland, made those officers some promise of being employed in your Majesty's service provided they quitted the service of the French, and pursuant thereto he directed a certain number of them to receive half pay according to the posts they quitted for some time, which was accordingly paid them till the order was superseded; but how many of the present petitioners are the same which quitted the Irish Army and received half pay Lord Coningsby cannot remember, only that Major Killicutt was one. 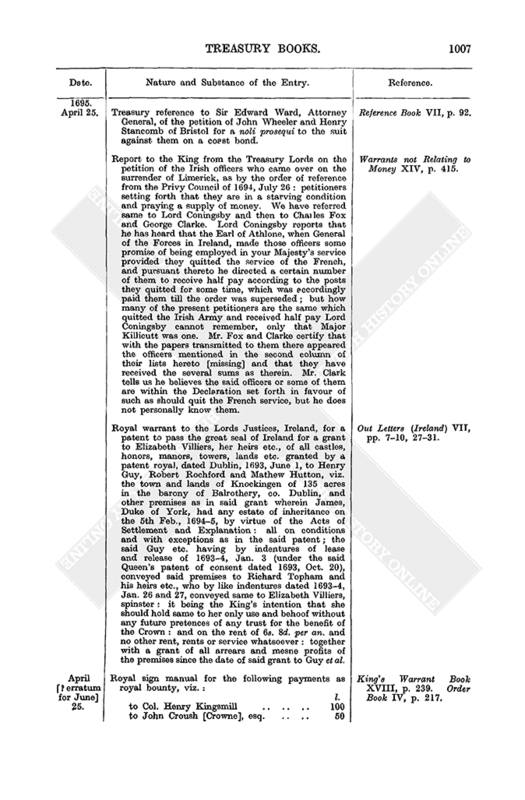 Mr. Fox and Clarke certify that with the papers transmitted to them there appeared the officers mentioned in the second column of their lists hereto [missing] and that they have received the several sums as therein. Mr. Clark tells us he believes the said officers or some of them are within the Declaration set forth in favour of such as should quit the French service, but he does not personally know them. Warrants not Relating to Money XIV, p. 415. Royal warrant to the Lords Justices, Ireland, for a patent to pass the great seal of Ireland for a grant to Elizabeth Villiers, her heirs etc., of all castles, honors, manors, towers, lands etc. granted by a patent royal, dated Dublin, 1693, June 1, to Henry Guy, Robert Rochford and Mathew Hutton, viz. the town and lands of Knockingen of 135 acres in the barony of Balrothery, co. Dublin, and other premises as in said grant wherein James, Duke of York, had any estate of inheritance on the 5th Feb., 1694–5, by virtue of the Acts of Settlement and Explanation: all on conditions and with exceptions as in the said patent; the said Guy etc. having by indentures of lease and release of 1693–4, Jan. 3 (under the said Queen's patent of consent dated 1693, Oct. 20), conveyed said premises to Richard Topham and his heirs etc., who by like indentures dated 1693–4, Jan. 26 and 27, conveyed same to Elizabeth Villiers, spinster: it being the King's intention that she should hold same to her only use and behoof without any future pretences of any trust for the benefit of the Crown: and on the rent of 6s. 8d. per an. and no other rent, rents or service whatsoever: together with a grant of all arrears and mesne profits of the premises since the date of said grant to Guy et al. Out Letters (Ireland) VII, pp. 7–10, 27–31. April [? erratum for June] 25. 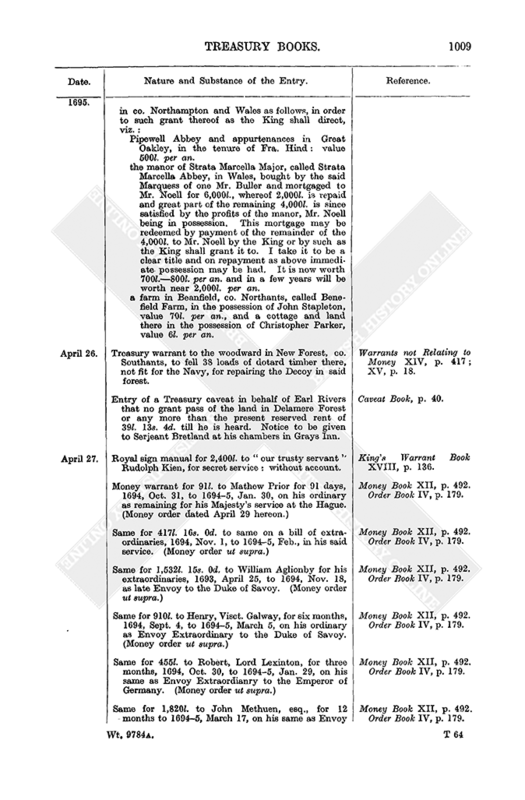 Royal sign manual for the following payments as royal bounty, viz. : l. King's Warrant Book XVIII, p. 239. Order Book IV, p. 217. Royal sign manual for 300l. to Paul Foley, Speaker of the House of Commons, for 60 days, May 4 last to July 3 following, on his allowance of 5l. a day. (Money warrant dated July 19 hereon.) (Money order dated July 24 hereon.) King's Warrant Book XVIII, p. 239. Order Book IV, p. 218. Treasury warrant to Mr. Marriott to pay 41l. to Henry Dixon, who was employed by you to go to Cumberland to take care for managing the forfeited estate late belonging to Visct. Preston there. Money Book XII, p. 490. 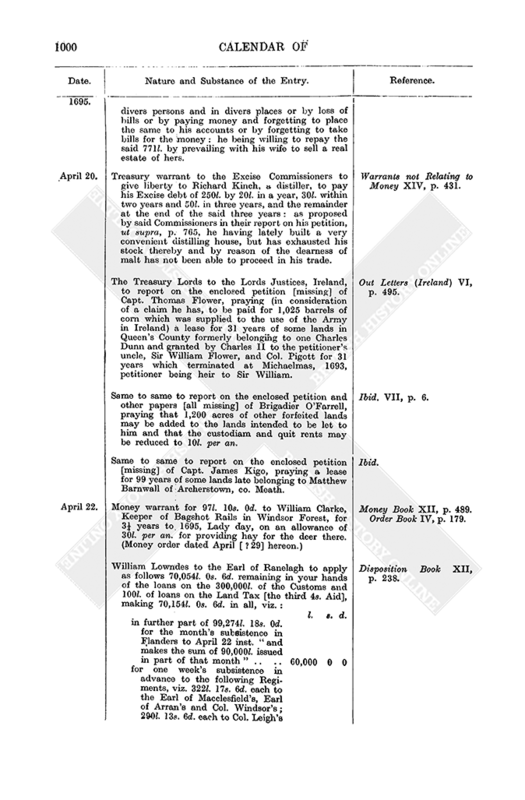 William Lowndes to the Auditor of the Receipt to issue (out of loans on the Hereditary and Temporary Excise) 2,000l. to Lord Edward Russell, Treasurer of the Chamber; in further part of 6,874l. 7s. 4d. intended for the servants [payable in the Office of Treasurer of the Chamber] who are to attend the King the next campaign. Disposition Book XII, p. 240. Same to Mr. Bartholomew Burton to pay (out of moneys in your hands for discounts and rewards of loans) 59l. 10s. 2¾d. to the executors of Edward Lascells, deceased, as 2 per cent. reward on 5,000l. by him lent on the Hereditary and Temporary Excise, 1694, April 24, to the time of repayment thereof, as by the certificate of Mr. Story, Deputy Comptroller of the Excise Accounts. Ibid. Same to the Auditor of the Receipt to issue 22,399l. 3s. 11d. to Edward Russell, esq., Treasurer of the Navy, on the unsatisfied order in his name for the service of the Navy and Victualling: to be issued out of loans to be made by said Treasurer or his cashier on credit of the 300,000l. per an. of the Customs: and to be paid over to Victualling Commissioners on account. “This completes the proportion of 136,399l. 3s. 11d. for the Victualling out of the said fund.” Ibid. 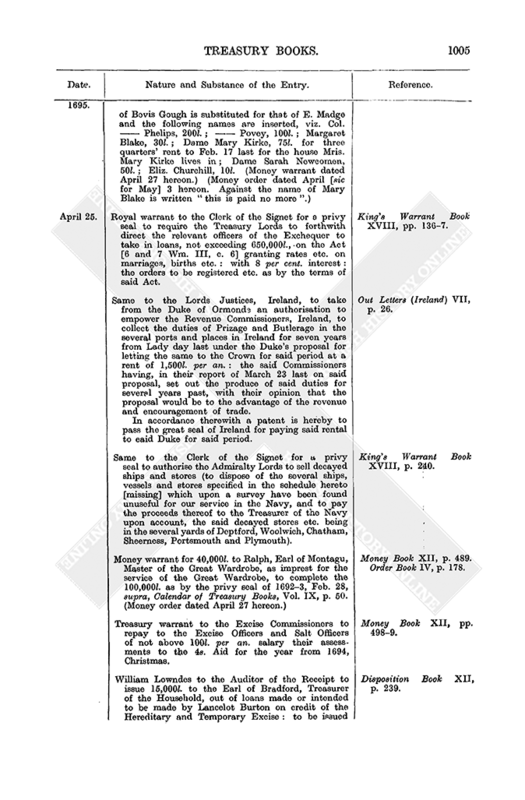 Same to the Earl of Ranelagh to report on the enclosed petition [missing] of Martha Brehen, widow, praying payment of the arrears due to her late husband as Lieut. in Sir David Colyear's Regiment. Out Letters (General) XIV, p. 380. 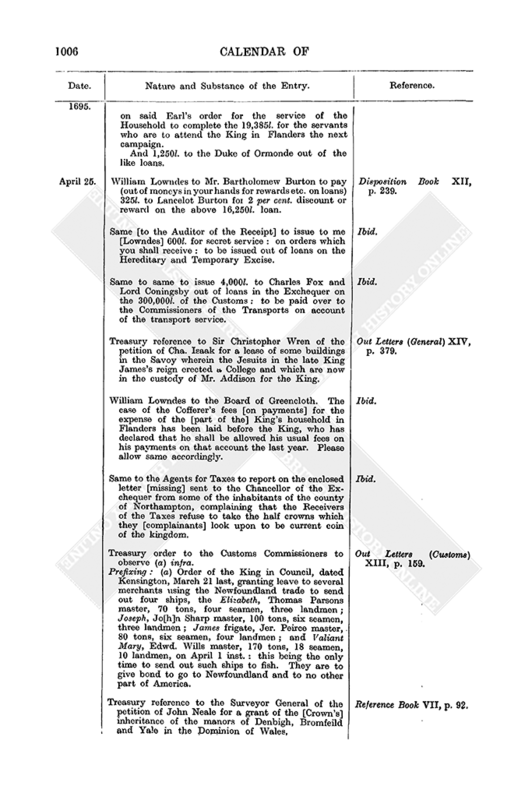 Treasury warrant to the Customs Commissioners to employ Thomas Mathews as a tidesman at Scarborough in Hull port loco Cornelius Moon, who is unable to perform the duty. Out Letters (Customs) XIII, p. 168. Ambrose Bewick as a tidesman in fee, London port, loco Thomas Christmas, deceased. Treasury reference to Samuell Travers, Surveyor General of Crown Lands, of the petition of Lady Fitzharding, shewing that Charles II granted to Lady Roscommon for life a small tenement adjoining the palace of St. James's which petitioner has now bought for 1,075l. ; therefore praying a lease thereof immediately after the decease of Lady Roscommon. Reference Book VII, p. 92. Pipewell Abbey and appurtenances in Great Oakley, in the tenure of Fra. Hind: value 500l. per an. the manor of Strata Marcella Major, called Strata Marcella Abbey, in Wales, bought by the said Marquess of one Mr. Buller and mortgaged to Mr. Noell for 6,000l., whereof 2,000l. is repaid and great part of the remaining 4,000l. is since satisfied by the profits of the manor, Mr. Noell being in possession. This mortgage may be redeemed by payment of the remainder of the 4,000l. to Mr. Noell by the King or by such as the King shall grant it to. I take it to be a clear title and on repayment as above immediate possession may be had. It is now worth 700l.–800l. per an. and in a few years will be worth near 2,000l. per an. a farm in Beanfield, co. Northants, called Benefield Farm, in the possession of John Stapleton, value 70l. per an., and a cottage and land there in the possession of Christopher Parker, value 6l. per an. Treasury warrant to the woodward in New Forest, co. Southants, to fell 38 loads of dotard timber there, not fit for the Navy, for repairing the Decoy in said forest. Warrants not Relating to Money XIV, p. 417; XV, p. 18. 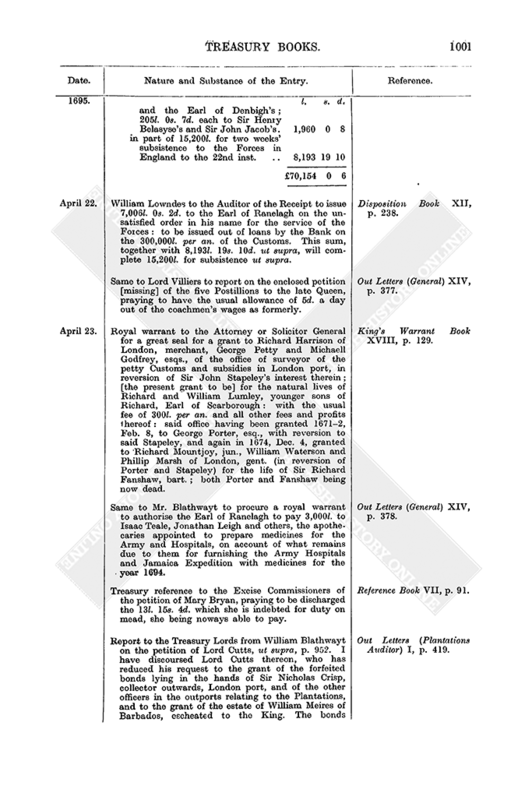 Entry of a Treasury caveat in behalf of Earl Rivers that no grant pass of the land in Delamere Forest or any more than the present reserved rent of 39l. 13s. 4d. till he is heard. Notice to be given to Serjeant Bretland at his chambers in Grays Inn. Caveat Book, p. 40. Royal sign manual for 2,400l. to “our trusty servant” Rudolph Kien, for secret service: without account. King's Warrant Book XVIII, p. 136. Money warrant for 91l. to Mathew Prior for 91 days, 1694, Oct. 31, to 1694–5, Jan. 30, on his ordinary as remaining for his Majesty's service at the Hague. (Money order dated April 29 hereon.) Money Book XII, p. 492. Order Book IV, p. 179. Same for 417l. 16s. 0d. to same on a bill of extraordinaries, 1694, Nov. 1, to 1694–5, Feb., in his said service. (Money order ut supra.) Money Book XII, p. 492. Order Book IV, p. 179. Same for 1,532l. 15s. 0d. to William Aglionby for his extraordinaries, 1693, April 25, to 1694, Nov. 18, as late Envoy to the Duke of Savoy. (Money order ut supra.) Money Book XII, p. 492. Order Book IV, p. 179. Same for 910l. to Henry, Visct. Galway, for six months, 1694, Sept. 4, to 1694–5, March 5, on his ordinary as Envoy Extraordinary to the Duke of Savoy. (Money order ut supra.) Money Book XII, p. 492. Order Book IV, p. 179. Same for 455l. to Robert, Lord Lexinton, for three months, 1694, Oct. 30, to 1694–5, Jan. 29, on his same as Envoy Extraordianry to the Emperor of Germany. (Money order ut supra.) Money Book XII, p. 492. Order Book IV, p. 179. Same for 1,820l. to John Methuen, esq., for 12 months to 1694–5, March 17, on his same as Envoy Extraordinary to Portugal. (Money order ut supra.) Money Book XII, p. 492. Order Book IV, p. 179. Money warrant for 538l. to John Methuen, esq., for two bills of extraordinaries in his said service as allowed by Secretary Trenchard. (Money order ut supra.) Money Book XII, p. 492. Order Book IV, p. 179. Same for 182l. to John Robinson, gent., for three months, 1694, Oct. 31, to 1694–5, Jan. 30, on his ordinary as Agent in Sweden. (Money order ut supra.) Money Book XII, p. 492. Order Book IV, p. 179. Same for 1,820l. to Alexander Stanhope, esq., for 12 months to 1694–5, Feb. 14, on his same as Envoy Extraordinary to Spain. (Money order ut supra.) 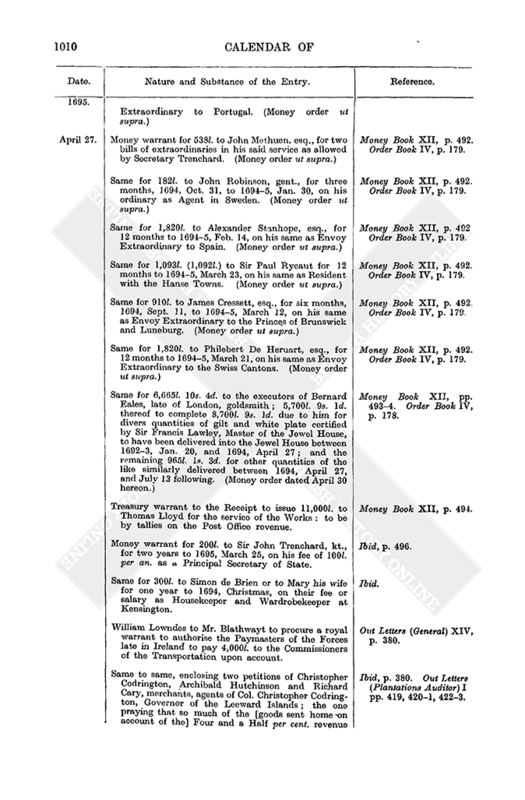 Money Book XII, p. 492 Order Book IV, p. 179. Same for 1,093l. (1,092l.) to Sir Paul Rycaut for 12 months to 1694–5, March 23, on his same as Resident with the Hanse Towns. (Money order ut supra.) Money Book XII, p. 492. Order Book IV, p. 179. Same for 910l. to James Cressett, esq., for six months, 1694, Sept. 11, to 1694–5, March 12, on his same as Envoy Extraordinary to the Princes of Brunswick and Luneburg. (Money order ut supra.) Money Book XII, p. 492. Order Book IV, p. 179. Same for 1,820l. to Philebert De Heruart, esq., for 12 months to 1694–5, March 21, on his same as Envoy Extraordinary to the Swiss Cantons. (Money order ut supra.) Money Book XII, p. 492. Order Book IV, p. 179. Same for 6,665l. 10s. 4d. to the executors of Bernard Eales, late of London, goldsmith; 5,700l. 9s. 1d. thereof to complete 8,700l. 9s. 1d. due to him for divers quantities of gilt and white plate certified by Sir Francis Lawley, Master of the Jewel House, to have been delivered into the Jewel House between 1692–3, Jan. 20, and 1694, April 27; and the remaining 965l. 1s. 3d. for other quantities of the like similarly delivered between 1694, April 27, and July 13 following. (Money order dated April 30 hereon.) Money Book XII, pp. 493–4. Order Book IV, p. 178. Treasury warrant to the Receipt to issue 11,000l. to Thomas Lloyd for the service of the Works: to be by tallies on the Post Office revenue. Money Book XII, p. 494. Money warrant for 200l. to Sir John Trenchard, kt., for two years to 1695, March 25, on his fee of 100l. per an. as a Principal Secretary of State. Ibid, p. 496. Same for 300l. to Simon de Brien or to Mary his wife for one year to 1694, Christmas, on their fee or salary as Housekeeper and Wardrobekeeper at Kensington. Ibid. William Lowndes to Mr. Blathwayt to procure a royal warrant to authorise the Paymasters of the Forces late in Ireland to pay 4,000l. to the Commissioners of the Transportation upon account. Out Letters (General) XIV, p. 380. Same to same, enclosing two petitions of Christopher Codrington, Archibald Hutchinson and Richard Cary, merchants, agents of Col. Christopher Codrington, Governor of the Leeward Islands; the one praying that so much of the [goods sent home on account of the] Four and a Half per cent. revenue may be sold as may satisfy the arrear of his salary of 700l. per an. ordered him by the privy seal of 1689–90, Jan. 22, and Treasury warrant of 1689–90, Feb. 7, viz. since 1694, Oct. 26, and that the contingent charges of the Government [there] may again be directed by warrant to be provided for out of the said revenue: the King having directed (on the sending from England of the Regiment now in the said islands) that said revenue should pay the Governor's salary and the contingent charges of the Government and the remainder to be applied to the pay of said Regiment, which direction as to the Regiment hath been since altered and the said revenue [or duty goods] ordered to be shipped for England, which the collectors of that revenue have since accordingly done and without new directions will not pay the said salary of 700l. per an. : and that since the reduction of the Island of St. Christopher the port there is [at] the yearly charge of 80l. for the salary of a gunner and two matrosses, besides which there are other incident charges; wherefore he prays a new warrant for said salary and contingent charges to be satisfied there out of said revenue. Ibid, p. 380. Out Letters (Plantations Auditor) I pp. 419, 420–1, 422–3. And the other petition, praying that 964l. 4s. 8d. disbursed by said Colonel from 1694, June, to Dec. 7, for provisions for the use of the Regiment in those islands, may be paid “them” [to the said agents for him] and placed to the account of said Regiment and that on the clearing the arrears or the payment of the subsistence due to said Regiment he may be indemnified in all his engagements on account thereof and that measures may be taken to free him from the necessity of further engagements on that account; his credit and interest being already deeply engaged and must be further engaged for the supply thereof. William Lowndes to Mr. Blathwayt to procure a royal warrant to authorise the Earl of Ranelagh to pay 271l. 11s. 7d. to Mr. Hill for his account of contingent charges in the [Army] Pay Office in Flanders for one year to 1694–5, March 13. Out Letters (General) XIV, p. 381. Entry of the affidavit by Samuel Lupton of London, merchant, and Hugh Watson of Stockton, co. Durham, merchant, that Edward Fleatham (Fleet-ham) of Yarm, co. Yorks, merchant, and Rowland Place Dinsdale of co. Durham, merchant, shipped between Sept. and Dec, 1691, in the Rebecca pink at Stockton, Peter Travers master, bound to Barbados, 96 barrels containing 125 quarters of ground wheat, 20 quarters of white pease, 20,000 lb. weight of bread and beer, butter, beef and candles, which ship and goods were wrecked on Boomer Rocks, near Berwick on Tweed, whereof the ground wheat etc. was cast ashore and seized by the [Customs] officers of Berwick and re-delivered to Fleetham for re-export, who sold same to Samuell Lupton and by his order shipped same to Newcastle in the Dantzic Merchant of London, Thomas Grundy master, for export beyond seas, and the said Lupton swears that he so bought and shipped said goods from Newcastle and that the ship with her goods was in her voyage taken by the French and 10 days after was re-taken and brought into England and what of the said goods remained in said ship were shipped again in the said ship to parts beyond the seas and there consumed. Out Letters (Customs) XIII, p. 169. Treasury reference to Samuell Travers, Surveyor General of Crown Lands, of Sir Christopher Wren's report of this day's date, infra, on Mr. Isaac's petition for the Jesuits' houses in the Savoy, ut supra, p. 1006. Reference Book VII, p. 92. Prefixing: said report. I have represented the situation and dimensions of the said houses, having by Treasury order often viewed the same in 1692 when they were first put into Mr. Addison's hands, and the map fully represents the state thereof. Same to same of the petition of Mr. Thomas Addison, praying to remain housekeeper in the Savoy and to have a grant of the houses described in a plan, supra, annexed to the Queen's warrant of 1692, Aug. 31, he being the first discoverer and having been at above 500l. charge in necessary repairs. Ibid, p. 93. Royal warrant to the Lords Justices, Ireland, for a patent to pass the great seal of Ireland to remit and release to Thomas Keightley, his heirs etc., the remaining rent of 529l. 11s. 6d. payable to the Crown on his three years' custodiam from 1694, May 1, of lands as follows, which were granted him at 1,356l. 10s. 0d. per an. ; out of which [rent] 123l. 10s. 0d. per an. is restored to former proprietors and 703l. 10s. 0d. is paid for interest of several incumbrances on the lands, so that there remains to the Crown only 529l. 11s. 6d., which he has prayed may be remitted. The quit rents and Crown rents payable out of the premises are to be reserved as still payable thereout. Out Letters (Ireland) VII, p. 12. Appending: schedule of said lands. forfeited lands of Christopher Cheevers: Carrignas-hanagh in Ferrard Barony, Co. Louth, 12l. ; Begsreeve and Lisboy, 22l. 8s. 0d., and Kennetstown, 23l. 3s. 6d., in Slane and Duleek Baronies, Co. Meath. forfeited lands of Roger Bellew: Rogerstown, 59l. 10s. 0d. (the proprietor restored and in possession). forfeited lands of Nicholas Darcy: Platin, 178l. (mortgaged to John Jennet for 1,568l. 18s. 0d. ); Calestown, 25l. ; all in Slane and Duleek Baronies. forfeited lands of Patrick Sarsfeild: Ballynegappagh and Kippoge, 140l. (under several elegits and the whole rent payable to Lord Scarborough, pursuant to the King's letter); in Carbury Barony, Co. Kildare. forfeited lands of Lau. Eustace: Bowleybeg in said barony, 60l. (in mortgage to a Protestant party in possession). forfeited lands of William Talbot: Fassaroe and part of Bathdown [Rathdown] in Rathdown Barony, Co. Wicklow: 76l. 15s. 0d. forfeited lands of Michaell and William Dardis: Gigginstown and Rickardstown, in Delvin Barony, Co. Meath [Westmeath], 77l. (Garret Dardis, a minor, claims the fee simple of these lands by virtue of a deed of settlement found on the inquisition). forfeited lands of Redmond and Hugh Mulledy: Grangemore in Farbill Barony, 71l. forfeited lands of Garret Dillon: Drumraney, 67l., two separate thirds of Inchmore and a parcel of bog, 7l. 10s. 0d., all in Kilkenny West Barony (incumbrances on these lands found on the inquisition to the [full] value thereof); Brannockstown in Fartullagh Barony, 45l. forfeited lands of Patrick Everard: one house in Navan town, Co. Meath, 3l. 10s. 0d. forfeited lands of Christopher Hussey: Ferrans, Oldtown and Little Ardrums in Deece Barony, 100l. forfeited lands of James Hussey: Great Ardrums in said barony, 64l. (claimed by an Article-man of Limerick, who is adjudged). forfeited lands of Walter Nangle: Coclronan in Lune Barony, 70l. forfeited lands of Peter Dillon: Corra, part of Drumeany, all in Rathconrath Barony, Co. Westmeath, and Currus in Clonlonan Barony, these two sets together let at 52l. 10s. 0d. incumbered to the [full] value as aforesaid). forfeited lands of Man. Connell: Ashtown and Irishtown in Castleknock Barony, Co. Dublin, 67l. 10s. 0d. (850l. judgments to several Protestants). forfeited lands of Adam Cromp: Drimidaly [Derringdaly] in Moyfenrath Barony, 50l. forfeited lands of Mi. Chamberlain: Chamberlainstown in Kells Barony, 40l. (though set at 40l., yet in lease to James Reiley at the rent of 16l. per an. by the proprietor). forfeited lands of Christopher Evers: Great Ballardan in Navan Barony, 45l. (in mortgage to James Reilly for 100l.). Total, 1,356l. 11s. 6d. per an. ; whereof, restored to proprietors, 123l. 10s. 0d. ; interest for incumbrances, 703l. 10s. 0d. William Lowndes to the Auditor of the Receipt to issue 21,233l. 16s. 7d. to the Earl of Ranelagh out of loans in the Exchequer on the 300,000l. per an. of the Customs: on the unsatisfied order in his name for the Forces: to be applied for services as follows, viz. : l. s. d. Disposition Book XII, p. 241. William Lowndes to the Earl of Ranelagh to apply the abovesaid sum as above. The 11,800l. and 5,000l. items are appointed in lieu of the tallies which were directed to be applied by you the 18th inst., supra, p. 995, to those two heads. Please reserve these tallies in your hands for such further uses as my Lords shall appoint. Disposition Book XII, p. 241. Same to the Auditor of the Receipt to issue (out of loans on the Act for Births and Marriages) 300l. to Charles Fox and Lord Coningsby, Paymasters of the Forces late in Ireland; 150l. thereof for Sir James Jeffrys in lieu of his pretensions as late Colonel in Ireland to 1690, Aug. 30, and as Governor of Duncannon Fort to 1691–2, Jan. I, from which time the Irish Establishment commences: and 150l. for Monsieur La Fausselle, Lieut. Governor of Sligo, on account of arrears of pay due to him as Capt. of Grenadiers in the late Col. Callimote's Regiment, now under Col. Bellcastle. Ibid, p. 242. 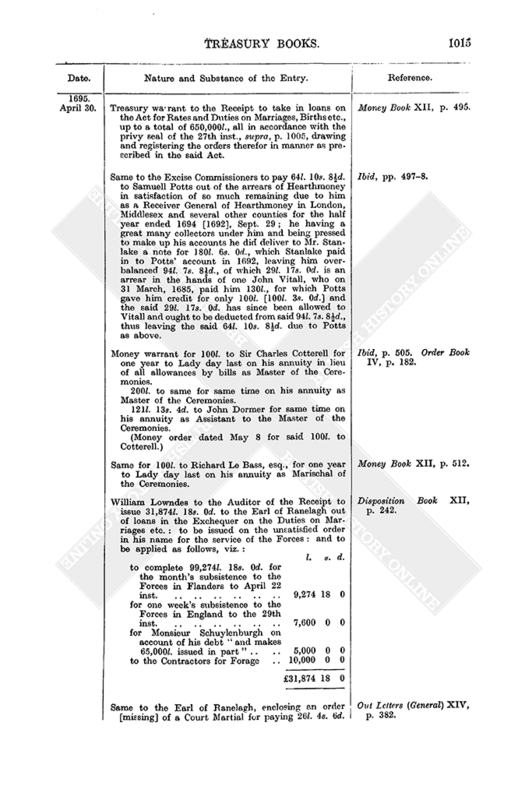 Same to Lord Coningsby to report on the enclosed petition [missing] of Dr. Robert Gorge, setting forth that he was employed by the late Duke of Schonburgh in Ireland as his secretary after the death of Mr. Holford, for which employ there was an allowance of 40s. a day on the Establishment of War and Train, of which he never received a penny. Out Letters (General) XIV, p. 381. 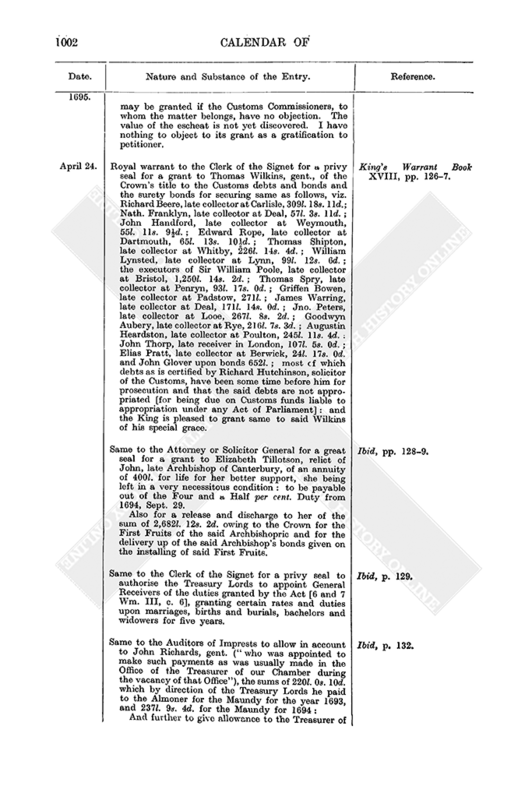 Same to the Attorney or Solicitor General to report on the enclosed petition [missing] of James Zouch, esq., praying a grant of the [Crown's] reversion of the manors of Woking, Chobham, Bisley and Bagshot and the Hundred of Woking and Black-heath and Wotton, co. Surrey, of which he is seized in fee tayle by patent from James I to his grandfather, Sir Edward Zouch; to enable petitioner to cut off the entail and pay his debts and make provision for his family. Ibid. Same to the Earl of Romney [as Master of the Ordnance] to report on the enclosed petition [missing] of the Governor and Company for making hollow Sword Blades in England, praying that the forfeiture upon the importation of sword blades into England may be given to them to enable them to suppress the said importation and to encourage the manufacture of sword blades at home; said petition being referred to the Treasury by the Privy Council. Ibid, p. 382. Entry of a Treasury caveat in behalf of Henry, Duke of Beaufort, and Thomas, Earl of Pembroke, that no grant pass of any part of the estate of the late Marquess of Powis till they are heard. Notice to be given to Mr. Jenings at his house in Little Lincolns Inn Fields. Caveat Book, p. 40. Treasury allowance of the 1694, Christmas quarter's incidents bill of the Excise: total, 1,454l. 2s. 11d. Money Book XII, p. 494. Treasury warrant to Mr. Knight [Customs Cashier] to pay 285l. 2s. 6d. to Gilbert, Bishop of Sarum, Chancellor of the Order of the Garter, for half a year to March 25 last on the annuity for the support of the honour of that Order. Ibid. 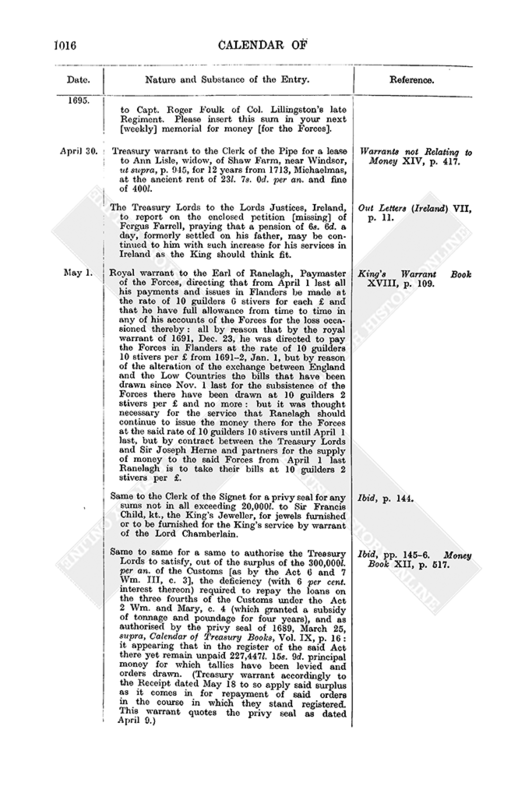 Treasury warrant to the Receipt to take in loans on the Act for Rates and Duties on Marriages, Births etc., up to a total of 650,000l., all in accordance with the privy seal of the 27th inst., supra, p. 1005, drawing and registering the orders therefor in manner as prescribed in the said Act. Money Book XII, p. 495. Same to the Excise Commissioners to pay 64l. 10s. 8½d. to Samuell Potts out of the arrears of Hearthmoney in satisfaction of so much remaining due to him as a Receiver General of Hearthmoney in London, Middlesex and several other counties for the half year ended 1694 , Sept. 29; he having a great many collectors under him and being pressed to make up his accounts he did deliver to Mr. Stan-lake a note for 180l. 6s. 0d., which Stanlake paid in to Potts' account in 1692, leaving him overbalanced 94l. 7s. 8½d., of which 29l. 17s. 0d. is an arrear in the hands of one John Vitall, who on 31 March, 1685, paid him 130l., for which Potts gave him credit for only 100l. [100l. 3s. 0d.] and the said 29l. 17s. 0d. has since been allowed to Vitall and ought to be deducted from said 94l. 7s. 8½d thus leaving the said 64l. 10s. 8½d. due to Potts as above. Ibid, pp. 497–8. Money warrant for 100l. to Sir Charles Cotterell for one year to Lady day last on his annuity in lieu of all allowances by bills as Master of the Ceremonies. Ibid, p. 505. Order Book IV, p. 182. 200l. to same for same time on his annuity as Master of the Ceremonies. 121l. 13s. 4d. to John Dormer for same time on his annuity as Assistant to the Master of the Ceremonies. Same for 100l. to Richard Le Bass, esq., for one year to Lady day last on his annuity as Marischal of the Ceremonies. Money Book XII, p. 512. William Lowndes to the Auditor of the Receipt to issue 31,874l. 18s. 0d. to the Earl of Ranelagh out of loans in the Exchequer on the Duties on Marriages etc. : to be issued on the unsatisfied order in his name for the service of the Forces: and to be applied as follows, viz. : l. s. d. Disposition Book XII, p. 242. Same to the Earl of Ranelagh, enclosing an order [missing] of a Court Martial for paying 26l. 4s. 6d. to Capt. Roger Foulk of Col. Lillingston's late Regiment. Please insert this sum in your next [weekly] memorial for money [for the Forces]. Out Letters (General) XIV, p. 382. Treasury warrant to the Clerk of the Pipe for a lease to Ann Lisle, widow, of Shaw Farm, near Windsor, ut supra, p. 945, for 12 years from 1713, Michaelmas, at the ancient rent of 23l. 7s. 0d. per an. and fine of 400l. Warrants not Relating to Money XIV, p. 417. The Treasury Lords to the Lords Justices, Ireland, to report on the enclosed petition [missing] of Fergus Farrell, praying that a pension of 6s. 6d. a day, formerly settled on his father, may be continued to him with such increase for his services in Ireland as the King should think fit. Out Letters (Ireland) VII, p. 11.